It’s probably fair to say that the proverbial bullish kitchen sink has been thrown at this market. BOJ QE, PBOC rate cut, magic ECB QE rumors and now the best jobs report in years and markets closing at record highs. Bad news doesn’t matter and now time for Santa Claus. On the surface it remains a bullish nirvana as money remains cheap, liquidity high and hardly even a single down day observed in markets that go up day after day. We even almost got the seemingly pre-ordained 18K on the $DJIA on Friday. Yes the marketing is great, but is there a money back guarantee with this product that is being incessantly sold to a retail public that keeps shoving cash into this market in amounts not seen since 2007? According to Trim Tabs, $42 billion has flown into equity ETFs during the last 4 wks, the largest inflow since 2007. The retrace free upward bias in the market is incessant and even most bulls would acknowledge that the constant levitation above the 5 MA seems a bit eerie at this point. But constant central bank stimulus intervention talk and action since the mid October lows took on an unexpected fevered pitch. But despite the headlines this market is far from as bullish as the marketing campaign would have you believe and the weakness that keeps building underneath keeps pointing to danger lurking. I freely acknowledge that divergences and weak internals have not mattered, but they never do until they do and tops are processes and not events. Ask yourself what is being sold here? Massive global central bank interventions, record ETF inflows by retail, $VIX with an 11 handle amongst weakening internals and accompanying distribution behavior producing marginal new highs. Central bank intervention en masse accompanied by massive volatility in currencies and commodities. What does it all mean? For now apparently nothing. But given all the outlined above don’t be surprised if it means something at any time. Remember they don’t tell you to sell at the top or buy at the bottom. They tend to do the exact opposite. And right now retail is buying the all time highs. Again. FANTASTIC STUFF !!! This particular post, mark my words, will be the one that you highlight next year – when all this will actually mean something. Great stuff Northy! Thank you, well done. We could also add structural work, cycle work, and astro work to the mix. 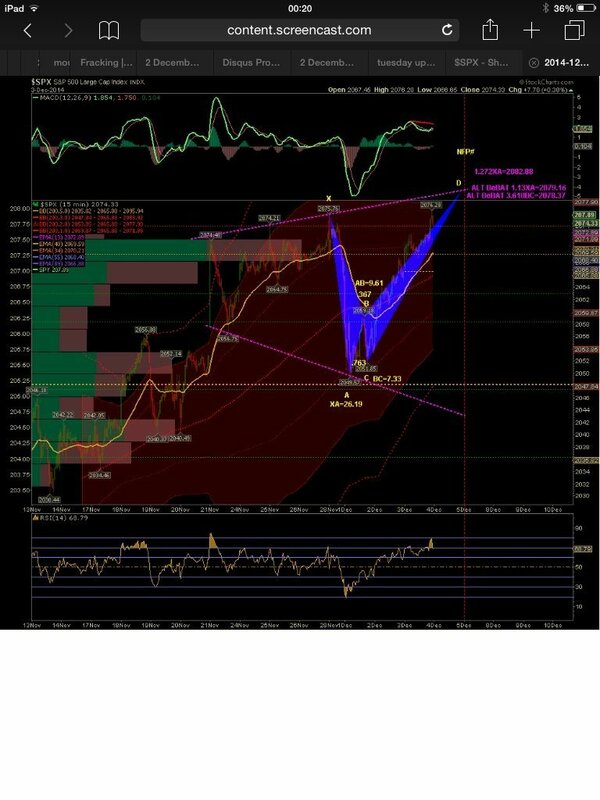 Before a bull leg ends we always see a corrective wave 4 precede it. This has been a missing link that prevented many chartist from predicting a substantial top in this bull market. But, the recent a,b,c, wave 4 dip to 1820ish in the SPX is a corrective wave 4 dip. This means we are in a wave 5 right now, and deep into the wave 5 at that. When this wave 5 is complete, we should expect a rather notable sell off. I am confident that at least the 1,2, and 3 of this 5 were complete on Nov. 11, 2014 at 2041 SPX. The wave 4 & 5 pattern since the 2041.27 spx high is a bit muddy allowing us to come up with two different possible outcomes. One of the outcomes suggest the SP is only days or hours from completing the final v of 5 high, and we should be watching for support failures early this week. On occasion, astrology can also be helpful with timing. We have two astro events this weekend that usually cause some kind of trend reversal in many markets ( including the S&P). They have a window of plus or minus 2 days. This means this window is only open until Tues. It is this timing tool combined with one of the structural wave counts that suggest we could see near term support levels begin to break as early as Monday or Tues. of this week. We also have two cycle highs due in the “big” picture. The 7 year cycles are 2000, 2007, 2014? If we go back and look at a yearly, we will note that a significant turn has also taken place every Fibonacci 13 years ( plus or minus 1 year). This cycle goes back for decades. 1974, Black Monday 1987, 2000, and now. 2014 would be Fib. 13 plus one which means if these cycle are to continue, the S&P must make a major high this month. We also have a Hindenburg Omen present. This doesn’t predict a fall, but, it has appeared just before every large fall I can remember. And, We’re in a perfect bearish harmonic pattern right now. This suggest near term support levels could be put under pressure as early as Monday. None of the things I have provided here say we should sell our farm and short the market. But the accumulation of all these indicators ( combined with Northman’s work) suggest we should have our finger on the short trigger if and when an impulse down materializes. It also suggest that continued buying at this point may be a risky endeavor.